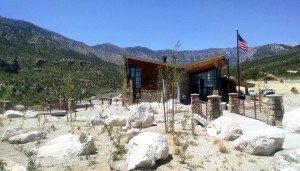 I’ve got one word for the new Spring Mountains Visitor Gateway on Kyle Canyon Road halfway up the side of Mt. Charleston. The word is wow. I said it as I drove through its monumental gate, and it escaped my lips a bunch more times as I walked around. This is no ordinary stop-and-use-the-restrooms way station. This place is a destination in itself. Perched on the slope just downhill from the Mt. Charleston Resort, the Gateway offers fabulous mountain and canyon views in every direction. A picnic area has shaded tables. A map provides a guide to a network of hiking trails. A central plaza honors the seven southern Paiute tribes. There are two amphitheaters. One has a colorful ceramic mosaic floor, and the other looks like it was flown in from ancient Greece. An “education building” has a spacious meeting room inside and a deck outside. A huge built-in stainless steel grill suggests that special events might be in the Gateway’s future. And did I mention the views? Breathtaking vistas, no matter where you turn your head. 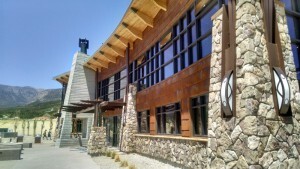 The largest building on the site is the Visitor Center. While it boasts appealing displays and friendly rangers inside, I found the structure itself the most fascinating. Its heating and cooling system relies on an eco-friendly system of buried heat-exchanging coils. Its computer-controlled windows open and close in response to sun and temperature changes. Lofty beamed ceilings soar over polished concrete floors. The paneling on the interior walls is old-growth redwood salvaged from old picnic tables and benches. All this would be enough to make the Gateway well worth the drive from Las Vegas, but there’s more. Outside the Visitor Center, it is impossible not to notice a large mangled airplane propeller attached to a tall monolith. 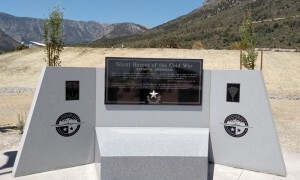 This arresting artifact, which now serves as the entrance to a new national memorial dedicated to the “Silent Heroes of the Cold War,” came from the wreckage left by a plane that crashed into the side of Mt. Charleston in 1955. All fourteen men who were aboard the plane perished. They had been headed to Area 51, where they were involved in the development of the U-2 spy plane. “In memory of the Silent Heroes of the Cold War, the men and women who labored under a veil of secrecy, often putting their lives in peril for the good of the nation. Our peace and prosperity will always depend on the bravery of unsung Americans willing to make the ultimate sacrifice without recognition.” More information about the Silent Heroes of the Cold War National Memorial. History, culture, nature, technology, recreation –the new Spring Mountains Gateway has it all. It was not only the elevation that took my breath away. The Gateway is on the former site of a failed resort with a former golf course and so the Forest Service has reconditioned the landscape and used the golf course area for a series of new hiking and walking trails. Very nice place for kids. And the Memorial has a Facebook page if you would like to see more photos…. Wow! I am taking my Dad to this and his dog as they are a package deal. Wow — this sounds wonderful, and who doesn’t like a drive to the Mt. Charleston area? What are the hours of the visitor’s center??????? Great write-up. I’m taking my grand kids up there soon. Thanks! Our firm, LGA, from Las Vegas, is very proud of this recent project. Thank you for the nice article.